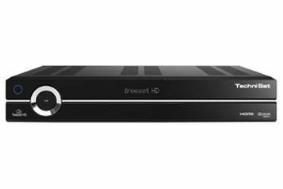 TechniSat introduces Freesat high-definition set-top box | What Hi-Fi? As well as receiving all the Freesat channels, the £190 TechniSat HDFS Freesat box also allows the playback of films, music and pictures from USB memory sticks or memory cards, or from a PC using a LAN connection ot TechniSat wi-fi adaptor. Martin Cole, TechniSat's managing director, says: "We are very pleased with our relationship with Freesat which has given us the opportunity to position TechniSat as a premium UK brand." The TechniSat Freesat HD box comes with a three-year guarantee and is available now from Currys, Comet, Maplin, Alltrade and Double D.
Back in February, TechniSat signed a deal with Freesat to manufacture high-definition set-top boxes for the satellite TV service.